Mixed Bell Pepper Pasta, this is an easy pasta recipe using penne pasta and three colors of bell peppers. My son is a great fan of this pasta. Whenever I make this for my kids, I will add less pepper powder and more tomato ketchup. Otherwise, we like it little spicy, so I will add more pepper powder and chili sauce. This recipe will be so colorful and tasty. In this recipe, I have used only bell pepper, you can also add vegetables of your choice. Red Chili Sauce - 1/2 tsp. 1. Keep all the ingredients ready to make Mixed Bell Pepper Pasta. a. Finely chop the onion, tomato and garlic. b. Chop the bell peppers into medium sized pieces. 2. Boil water in a vessel. Add salt and a teaspoon of oil. Add the pasta and cook as per the package instruction. 3. Heat butter in a pan and add chopped onion and saute till it turns transparent. Add chopped garlic and saute for a minute. 4. Add the chopped tomatoes and cook till soft. Add the chopped bell peppers. 5. Mix it well and add pepper powder and salt. Toss well. Sprinkle some water and cook with lid closed. 6. Once the bell peppers are half cooked, add the tomato ketchup and red chili sauce. Mix it well. 7. 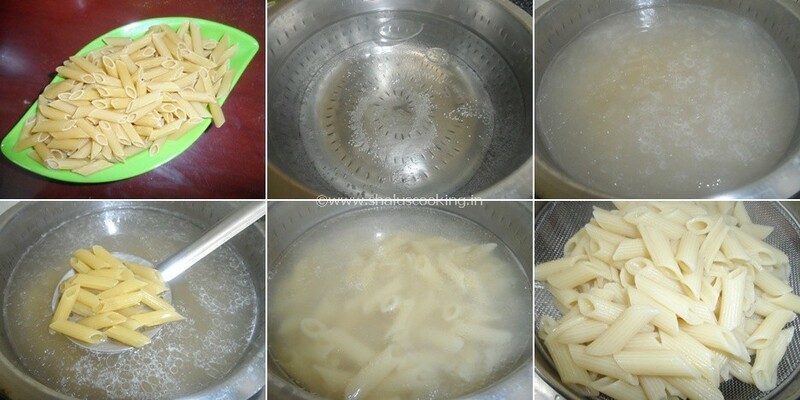 Add the cooked pasta and toss well. Let it sit on flame for 5 to 6 minutes. Colorful Mixed Bell Pepper Pasta is ready to serve.